Eclipsed by Danai Gurira, is set in Liberia in 2003 during its civil war. Can you tell us a little about the play and your role? How is the rehearsal process coming? Without giving too much away, the play really gives a voice to the women who have suffered and survived sexual slavery, loss of identity, and the brutality war brings. 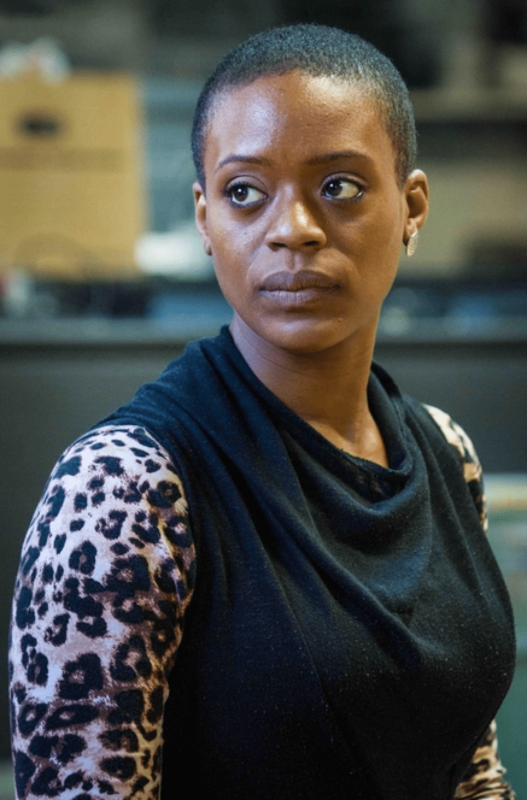 My character Rita is confident and educated, born to the superior class, a high flying merciless business woman whose life becomes devastated when her daughter is abducted by the LURD (Liberians United for Reconciliation and Democracy). Humbled by this she then becomes an advocate for peace and joins the Liberian Women for Peace Movement who were effective in bringing an end to the 14 year civil war. Her intentions however aren’t altogether selfless, by joining the movement she gains unprecedented access to the different LURD faction compounds, where she can begin her search in earnest. Rehearsals have been great, there has been a great deal of listening needed and despite the heavy context, we have found laughter. The five women – the three ‘wives’, the peace advocate and the rebel soldier – all employ different survival strategies as they cope with what’s happening to them and around them. What do you think Eclipsed tells us about the experience of women in this conflict? I think it just shows us how incredible and resourceful women can be when they are up against the wall. Hilary Clinton said that ‘women have always been the primary victims of war.’ Eclipsed has an entirely female cast – do you think that the play supports such a notion? Or is it just the story that Gurira wanted to tell? No I don’t agree. War is war and it effects everyone. As we’ve mentioned, the five characters in Eclipsed are subjected to this hugely traumatic experience, of being caught up in this civil war, of sexual slavery, of endless violence and suffering. Do you think there’s a feminist message within the play? It is sad that we have to even question if there is a feminist message within the play- had it been an all-male ensemble this question wouldn’t come up. Danai is simply addressing the balance and ensuring women are not written out of his- herstory, which is all too common. A couple of weeks ago I was at the National Student Drama Festival and attended a discussion on diversity in the arts chaired by Chris Haydon and featuring Tinuke Craig, both from the Gate Theatre. The discussion mostly focussed on race representation in the theatre. Obviously Eclipsed is a play with five Black female leads, which is great. But do you think that we, as an industry, could be doing more to further racial diversity in our theatre? And, if so, how might we go about achieving this? Absolutely we could be doing more! It has to start with not only the casting and body of work but addressing the lack of diversity in senior arts management. Once this is achieved then true change will occur. Speaking of diversity, audiences might recognise you from Russell T Davies’ Cucumber and Banana, broadcast on Channel 4 last month. What was the experience of working on both shows like? It has to be one of the best jobs to date! We had such a blast on that shoot. I think I would have to say I preferred Banana ever so slightly because it was just more of an intimate set and of course I got to work with the wonderful Charile Covell. It was amazing to see TV that celebrated both sexual and racial diversity – the shows seemed to be making a concerted effort to represent modern Britain as it is, which is really great. Having worked in theatre, TV and film, what do you think the importance of work like this is? You know, I wonder if Russell T Davies, Red Production and CH4 hadn’t had the balls to do a show that is, as you say representative of modern Britain, when would it of happened? What is great, now that the example has been set, is that it shows the networks, producers and the like how they can be more authentic and reflective in their casting and programming. Again it goes back to senior management. People generally speak from their narrative, if these happen to be predominately white middle class men then those are the stories you’re gonna hear.